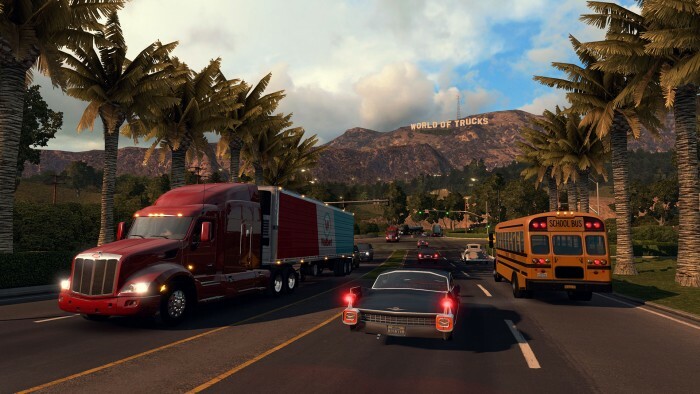 REVIEW: American Truck Simulator – PLAY! PLAY! If you’re a fan of the show “Ice Road Truckers” on the History Channel, here’s a game for you. Well, not just for you, but we can’t but feel that you’re the targeted demographic. You won’t be driving over ice though, at least not yet, but you will be driving American monstrosities over recognizable roads and towns of the USA. Good enough to start with. 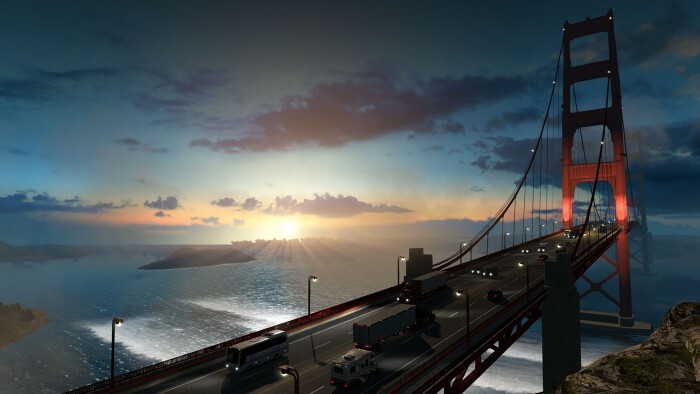 Euro Truck Simulator was a pretty big success for SCS Software, and they’ve upped the ante with this new simulator. Everything seems better, even though ETS2 didn’t suffer from any major issues. Therefore, here we might even have the most complete driving simulation in video gaming history (congratulations to all Rallies, etc., but this is like from another dimension). The biggest drawback is the decision to unlock the American continent “little by little”, similarly to ETS2, except that here it will take a longer time. At the start, you have Arizona and Nevada available, which is enough to get acquainted with the possibilities of American trucks and dusty roads of the “Wild West”. The biggest changes were made to the control mechanics. Namely, the transmission is the star of this game. 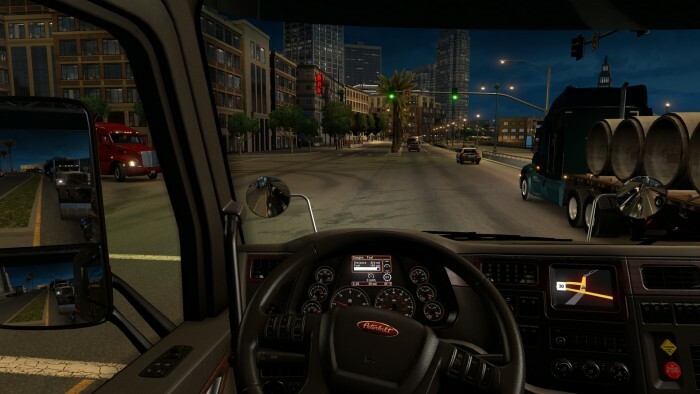 Depending on how dedicated to the simulation experience you are; whether you’re looking for some casual driving fun, or you’d rather put your trucking knowledge to the test, you’ll get to choose one of three possible driving modes. To start with, you have the automatic – a mode in which the gears are switched automatically, and all you have to do is control the gas and breaks. Sequential transmission as the second level of difficulty gives the most realistic experience of trucker’s everyday life. However, if you truly wish to experience from A to Z all the troubles and pleasures of driving with an eighteen-gear transmission system, you can choose the full manual transmission mode and attempt to dazzle the “Ice Road Truckers” while blazing your way across the roads of America. Yes, you’ve read correctly, unlike ETS2, here we drive 18-gear trucks and that’s the difference that will be toughest to accustom to. Besides the transmission, there were changes to the parking system as well, so now we have a bit more simplified direct entry into the marked space, as well as the classic professional parking in reverse. There’s also the recognizable USA design, with the cabin situated behind the motor block, unlike the Scania and other European trucks in which the cabin is situated “on top”. The world is now much livelier, with a diverse traffic and the presence of pedestrians. Also, ticketing is now handled differently. Namely, if you commit a traffic violation, you’ll be intercepted very soon and be fined with a considerable sum of your hard-earned money in an appealing animation accompanied with sirens and flashing lights. And finally, we’ll also mention the “World of Trucks”, a service dedicated to players who want to upload pictures of their prized trucks and there compete in a “like” system about whose “precious” is prettier. If you’re a fan, then you have to get ATS. And even if you’re not, do yourself a favor and play it, at least in the arcade mode. It’s much more fun than some of the “hyped” titles (yes Need for Speed, I mean you), and nothing compares to the experience of driving a truck at 4am while “Road to Hell” blares over the radio.